Easter egg rolling - game on! Tempting………….well, we thought we would introduce ‘Easter Egg Rolling’! On Wednesday 17th April at 1pm we will transform the kitchen into a creative corner where you will have 10 minutes to decorate your egg (we will provide hard boiled eggs) before going out into Queen Square to start the race (approx 1.15pm). There will be prizes for the best egg and the overall winner! Facts: Egg rolling, or an Easter egg roll is a traditional game played with eggs at Easter. Different nations have different versions of the game, usually played with hard-boiled, decorated eggs. 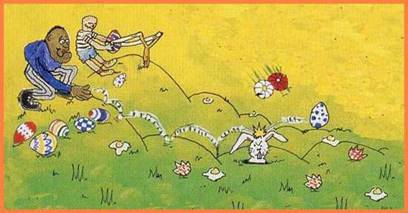 In the UK the tradition of rolling decorated eggs down grassy hills goes back hundreds of years and is known as "pace-egging". The eggs traditionally were wrapped in onion skins and boiled to give them a mottled gold appearance (although today they usually are painted) and the children competed to see who could roll their egg the farthest.